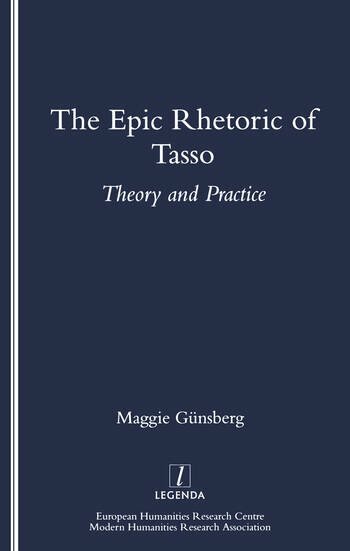 Maggie Gunsberg examines the "poetica" and "poesia" of Tasso in the context of the historical and cultural climate in which he lived. His epic theory is explored from the point of view of three rhetorical faculties current in 16th-century poetics: "inventio", "dispositio" and "elocutio". His discussion of "dispositio" reveals a fascinating similarity with ideas on art expressed by the Russian Formalists in the 1920s, a coincidence that can be attributed to the lasting influence of Aristotelian writings on plot. In her textual analysis of "Gerusalemme liberata", Dr. Gunsberg uses modern methodologies drawing on Freud, Lacan and the ideology of body language to develop new ways of reading the epic text. The two parts of this study, dealing with Tasso's theory and practice respectively, offer complementary aproaches that together illuminate his epic contribution.